Would you like to get the notes from dozens of social media experts talks- without having to show up? 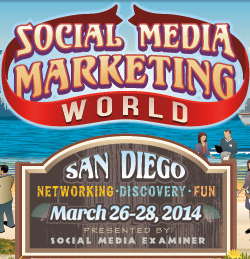 On Friday Social Media Examiner announced a virtual pass to their Social Media Marketing World event at the end of March. While I had been hoping to make it in person- it’s just too far from NY. I was excited to see the virtual pass and went to learn about it. Only $297 (for a limited time) – how can you beat that? Especially when the ticket alone to the event is near $1,000 plus travel, food, and accommodations. Yikes! I don’t travel without my family, so adding them to the mix was going to be a LARGE investment. How Does Social Media Marketing World Concern You? Chances are, you don’t have the time to listen to all of the experts and take notes. The event is multiple days long, and you’ve got a business to run. But my business is all about social media- I have to listen to everything, to give my clients the best service possible. Now you can benefit from my listening- Buy your virtual ticket through my affiliate link and I will send you a copy of all of my notes, after the event. You’ll have access to the latest and greatest information in social media and how it affects your business, without having to spend countless hours listening to the experts talk. That’s all you have to do. And I would suggest grabbing your ticket before this Friday because the price goes up (and they aren’t just saying that either). It goes up every week until the day of the event. Got questions? Leave them below, or email me! A great informative post about Social Media Marketing and what is going on around this world. I really want to be part of it. As the lessons of Social media marketing and digital marketing will be very helpful for me and for my business also. Nice information about Social media world. Social media marketing, Digital marketing and Internet Marketing are going to play a huge role in Search Engine Optimization. And the effort you are giving is really going to help all the business owners. Thank you Joe, I enjoy internet marketing and have a lot of fun helping others discover how it can transform their businesses.